As I arrive, I am thinking about the first stage of the Underscore: Arriving Energetically. I have been in that stage since I headed out the door, set in my intention to attend. Transitioning to the second phase I Arrive Physically, and I know that even as an observer I am—and will stay—part of the dance for the entire duration. Upon entering Velocity Dance Center I am startled by the warmth emanating from the large main studio. The audience is invited to remove their shoes, sit anywhere (cushions and chairs circle the space), and partake in the snack table. Art supplies are even available should the need arise. 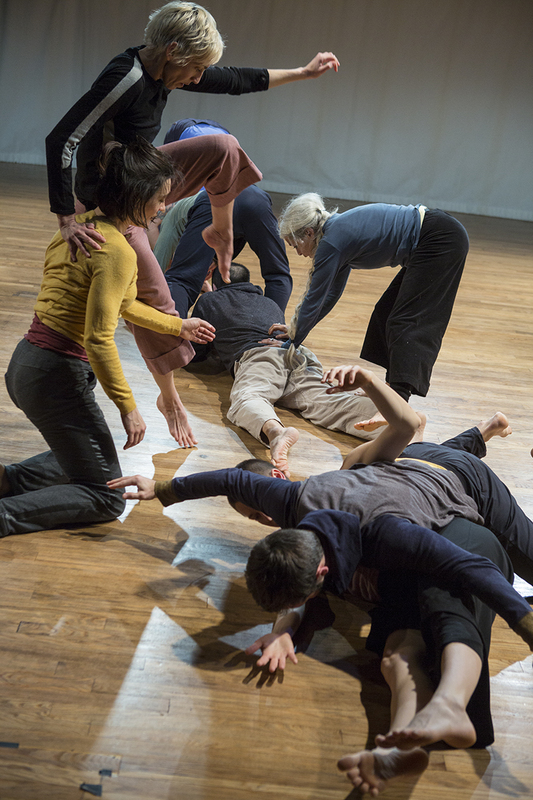 After a period of settling in, Stark Smith initiates the Opening Circle, where the thirteen performers from across the world introduce themselves. Then, smiling and closing her eyes, she invites the audience to say our names, all together. The dancers enter Preamubulation and begin to move about the space. There are eddies, flocks, and gentle collisions. Eventually the bouncing energy settles and the group is mostly still. There is a period of waiting, but I am present without expectation because I know there is no top-down decision to analyze: the choice is happening in this moment, and the group could move at any time. In the quiet I hear every movement, each individual footfall resonating. A tiny ripple through the spine of a standing dancer radiates across the space, and the other dancers seem to receive the energy, ever so subtly. They are listening with their bodies. Musician Mike Vargas enters with a single piano note. His composition is sparse so as to not dominate or dictate the dance. A barely audible tinkling of the keys complements the dancers as they break from their reverie, gently rocking or expanding. The transition is so organic that I am almost surprised to realize everyone is moving again. As the bodies intersect, the skill of these dancers is magnificent to watch. Each has cultivated the liquid softening between bones that transmits a draped ease in the body. This aesthetically pleasing quality arises from functionality. It allows the dancers to be responsive to unexpected force from any direction. It allows them to fall to the ground and redirect the impact. It allows them to communicate instantaneously through the skin and arrive in agile, unexpected lifts. There is a sort of catching, like that of breath but with the whole body, followed by a slow, controlled release. Witnessing feels like riding a wave, responding kinesthetically to a revolving, tumbling crash of bodies rising and falling, folding and spilling. The experience is comparable to watching an avid rock climber’s grace. The dancers know what ledges to push off of and where to stiffen, hold, or pull in order to dangle from seemingly impossible angles. Instead of rock faces, however, the ledges and handholds are other bodies—always shifting into rigidity or softness in order to cooperate or playfully undermine their partner. Within the cooperative dancing there is room for agitation. A dancer runs across the room and launches at another, wrapping with all four limbs. One active duet catches my attention where a man rolls repeatedly into another, who then redirects the force to spit him back out. Eventually they come to all fours, pressing skulls together. The pressure through the top of the head creates a resistance that allows his spine to arch into the press, changing forms. 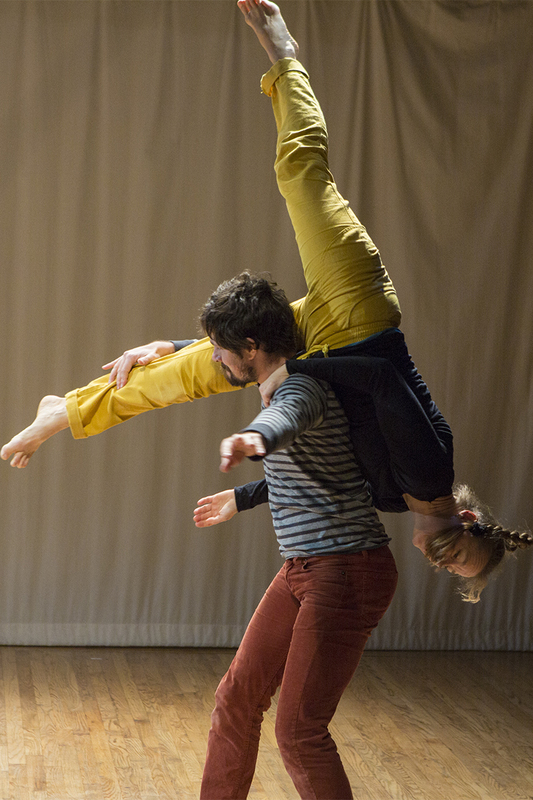 Other dancers find moments of personal expression outside of contact, investigating modes of movement in solo space. Sometimes an idea will catch on and pass through the group, or a happenstance intersection shifts the course of the dance in an instant. I get caught up in watching one busy quartet, only then to notice another group has crystallized into a suspended tableau: one dancer balanced high with legs floating over the other dancers’ heads. Moments like this, of quiet or stillness, pierce the action and provide counterpoint that frames the composition. Later a trio stands together for a long time, reaching slowly and watching. Their presence grounds the space as bodies tumble and swirl around them. After the dancing resolves we have the Harvest: time to write or think or relax in silence. Then to the final stage: Sharing. As a group we are invited to speak about our observations and experiences. This collective engagement feels completely organic and necessary to the completion of the whole. Perhaps it is the light, or the warm wood floors, or the contrast to the frigid outside world, but the whole room seems to be vibrating with this communal experience. The baby next to me cries out in delight as it watches the dancers. Stark Smith’s face has a tendency to spread with easy joy. It is not wrong to laugh or cry, or fall asleep. There is a giving and a receiving that feels effortless and unrestricted. A distinct glow has developed around the room, and it feels like some kind of physical manifestation of love. With the winter solstice almost upon us, the beauty of such openness seems to be calling forth an inner light. To learn more about the Underscore visit Nancy Stark Smith’s website or attend Seattle’s regular Underscore the second Saturday of every month, usually from 3pm-6pm with a talk-through at the beginning. 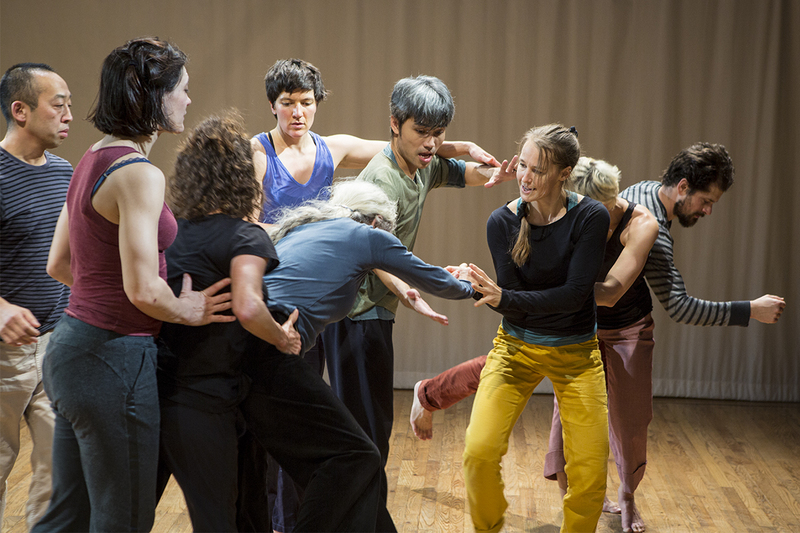 Join the Contact Improvisation Seattle Facebook group to get all the details.